Behind you is a Toxin Rifle (pick it up!) and either a Bennelli shot gun or a Redhawk, your choice. Proceed down the valley, it’s long with a lot of Dinos. Just keep out of site and if you don’t kill a Dino after three shots, just run and don’t look back. Save the Toxin rifle as it kills an animal with a single shot including the Rex. Save it for the end of the level but if you really want two guns for the whole level, don’t risk it. After the short drop you’ll meet an Albertosaurus. Head the complete opposite direction from him and he won’t see you. Now there are two Raptors to deal with. Nine times out of then, the first will charge at you. Waste them both and proceed. Continue through the valley but stay alert for Raptors. There is a hunting rifle near some poor old fellow’s remains. Carry on and be careful of the Raptors, keeping low is the key! There are some more short drops and ahead of you is a sneaky Raptor hiding behind a large rock. Go ahead of you to a clearing to find two shotguns now continue up the slope to the cliff. Beware of ambushing Raptors. Now continue along the coastline and get the AG-47, a reliable, long-lasting weapon. 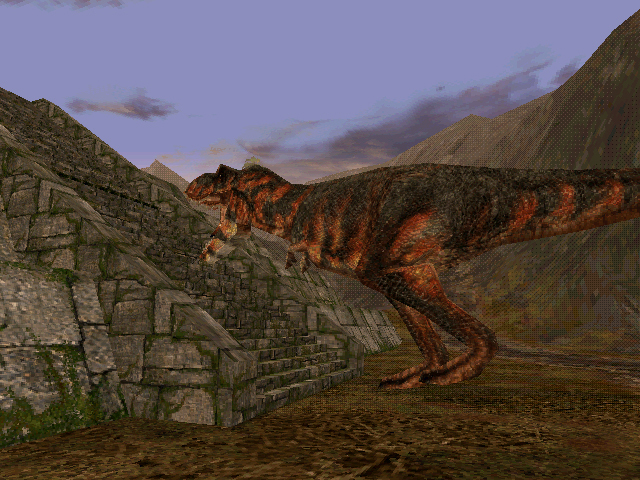 Run quickly to avoid the Raptors running down the cliff, you may have to fend off a couple of them if you’re too slow. Don’t get involved in the Raptors fighting the Stegosaurus, just leave them be and carry on after all, he’s a muck bigger kill than you! Now go away from the sea, inland to the next valley. Two Raptors will have you on the menu, after you change their dining plans head onto the old InGen jeep to an HK91. Keep to the right of the valley to avoid the Albertosaurus keep onto the wrecked jeep ahead to get the rifle and ammo. If the Albertosaurus chases you use the big rock to confuse the poor dinosaur. Now go to the large stone staircase. Be warned of the two Raptors that will attack here. If you don’t want to head up the dangerous stairs, to the right is a small road that bypasses the whole thing. But where’s the fun in that? Be careful of the pressure points on the floor, they’re the small green/black squares, these trigger the stone slabs that fall off the wall. These slabs stick out of the wall and don’t look like the rest of the scenery so keep your distance. Another trap are the stone heads at the top of the stairs. They fall as you head up the stairs, shoot them to knock them down before that, or else just be damn quick! If you’re going to dodge the heads, trigger the slabs off so as you run down the stairs, you can side step easy. Now it’s time for the Raptor infested ruins. Look around all of the buildings for weapons but keep your eyes peeled for Raptors and stone slabs that will fall if slightly nudged. Head to the big pyramid and make a run to climb up the steps, dodging the Rex. If you charges you too quickly run back to the smaller temples. If you saved the Toxin-Rifle take him out. Be careful of the stone head that will roll down the pyramid steps. If you didn’t kill the Rex, he’ll be waiting for you at the bottom of the pyramid. Drop to the step up from the bottom one and get the Rex’s attention now run all the way around to the other side to the front of the pyramid, drop off and head up the mountain trail. Don’t look back, there is a gap in the bridge but it’s small and easy to jump. Just run, the Rex will get tired. Onward to the next level.